Award-winning Lab Rascals science parties (age 5-14) provides a real “WOW” factor which will be remembered for years to come. Lab Rascals qualified scientists educate, inspire and entertain children with the magnificent world of science by allowing children to do all the experimenting themselves. The children will complete five different hands-on experiments including making self-inflating balloons, clouds, colour changing liquids, erupting volcanos and slime. 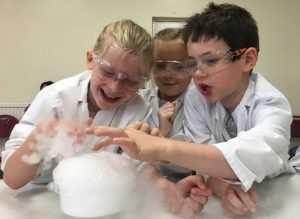 The children will complete six different hands-on experiments including making self-inflating balloons, clouds, colour changing liquids, smoking bubbles, dry ice rockets and bath bombs. Other party package options are available on our website. For more info please call us on 07825 285155, email Info@labrascals.co.uk or check out our Facebook page or website.